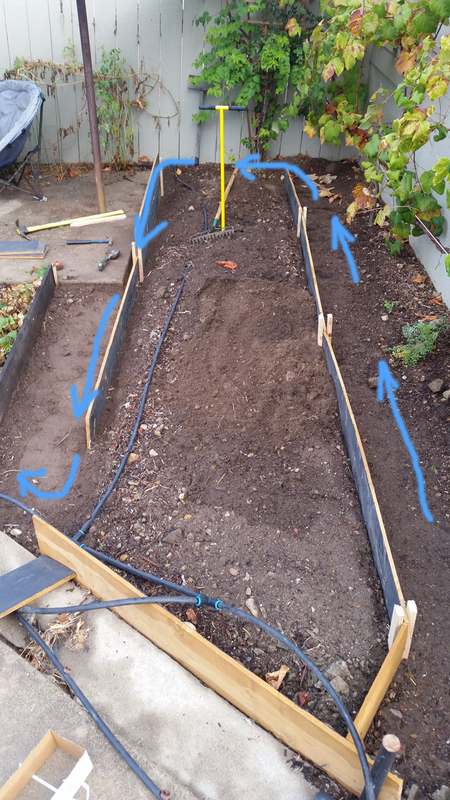 Planting a Winter Garden: Soil Repair Time! Hello dirty minded peeps! Well, as usual, I’m a bit late in my planting schedule. I was hoping to start my winter garden last month but have been swamped with other projects. This would be a poor time for most of you out there to start with the impending frost heading your way, but to folk living in SoCal it’s a moot point! This will be the first time I’ve ever tried doing a winter cover crop that wasn’t specifically just for the dinner table. What is a Winter Cover Crop? A winter cover crop consists of plants that are perfectly designed to repair the soil after all the leaching of nutrients that occurred during your spring and summer growing season. 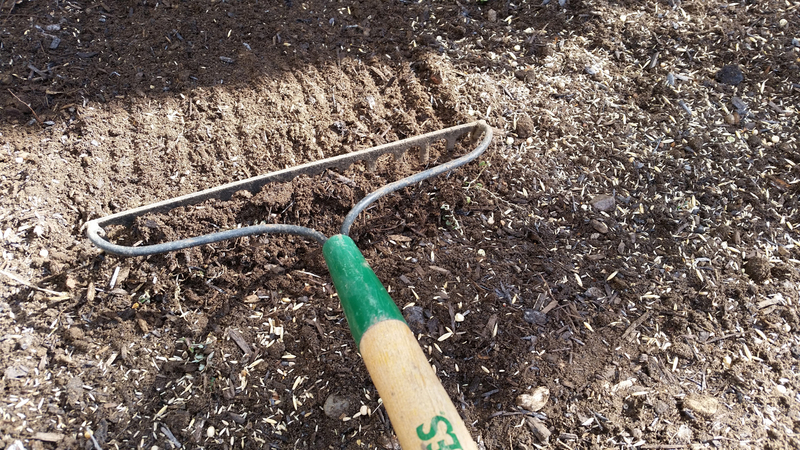 Not only do they add precious nitrogen to the soil, but many of the plants roots are perfect for reaching deep into the earth to break up the soil that your normal crops can’t reach. They then pull up the nutrients to make them accessible for the next spring/summer growing season. Then all you have to do is turn everything into the soil for a perfect green manure. It’s a win win situation! For more information on nitrogen fixing plants, check out my article on legumes! So the first thing I needed to do was to get the garden ready. I was getting tired of the many rows I made before and how inaccessible the whole garden was when everything was growing madly. 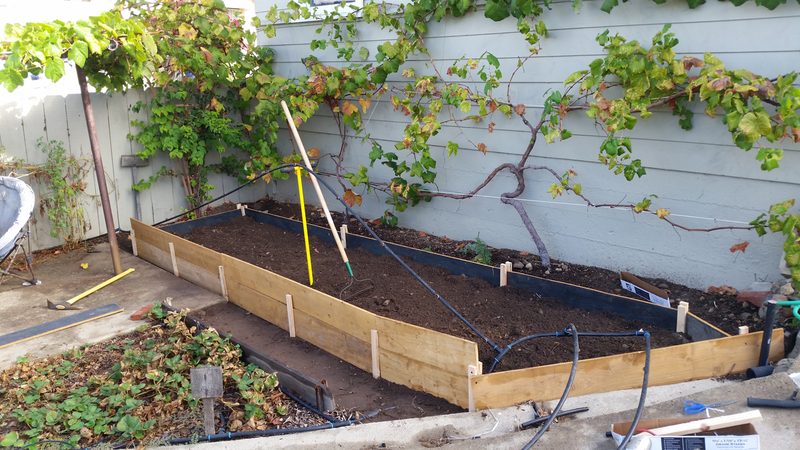 I decided that I wanted to consolidate everything into one, easy to get around, raised bed. I had a bunch of scrap cedar planks left over from an exhibition at The San Diego Museum of Art that were used for our Piranesi exhibit as rustic wood flooring. I used some of it to build my chicken coop, a compost staging bin as well as other yard projects. One of the many perks of working at the museum is repurposed materials! 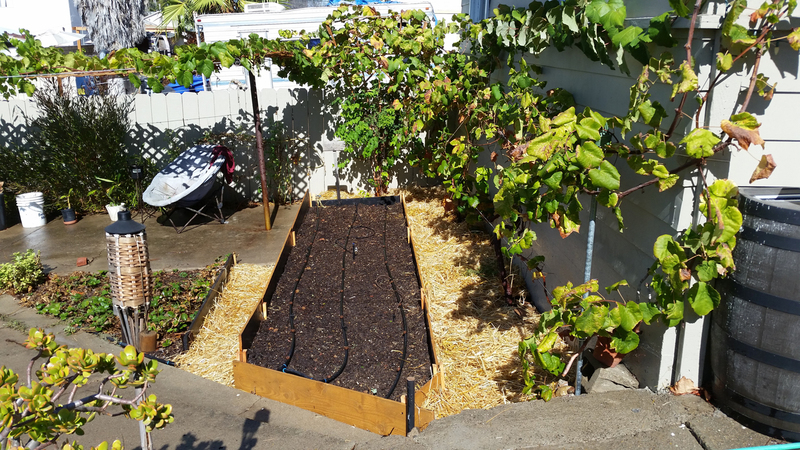 I began by pulling all the weeds out, removing the spent summer crops and raking the soil into a pile instead of the 4 rows it used to be. 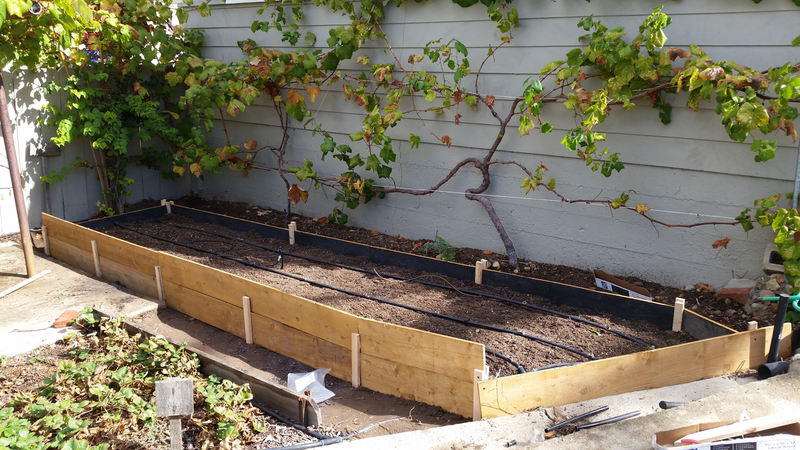 I had to move the micro drip irrigation in order to do all of this. I used two rows of cedar on this side because of the slope I have off of the back of my garage. 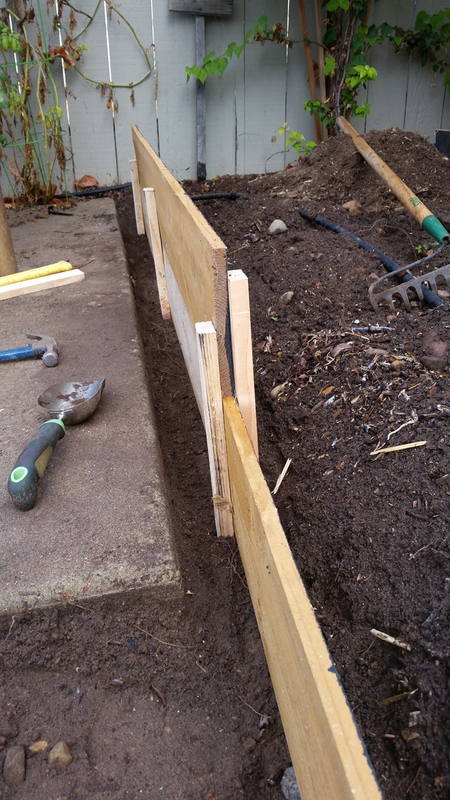 I also left a channel between the cedar planks and the concrete slab so the gray-water irrigation has a place to go as it seeps underneath into my garden. I’m trying to keep this very low-tech and very cheap. The only thing I bought for the project were the wood stakes for $3.27 at the Home Depot as well as manure and mulch to add to the soil. Here we have the finished cedar set up ready for the soil amendments. 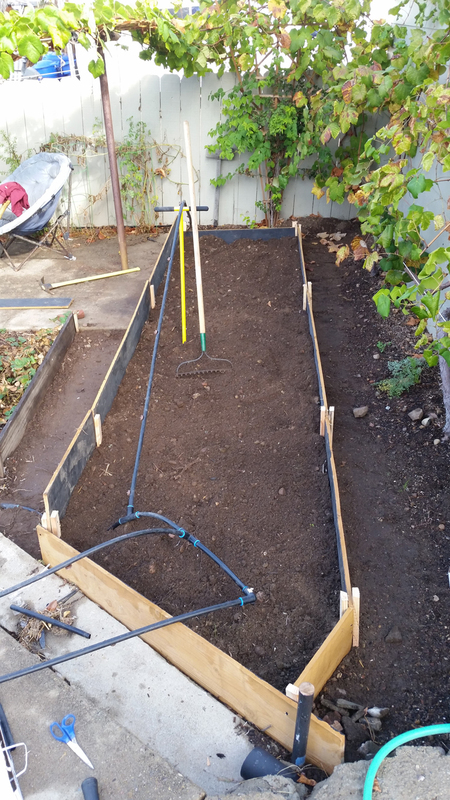 Now I raked the soil to a more level state and added two bags of manure and 3 cubic feet of soil enhancing mulch. And now it’s time to till the soil to mix everything together. Great! All done. Now to broadcast my seed mixture. 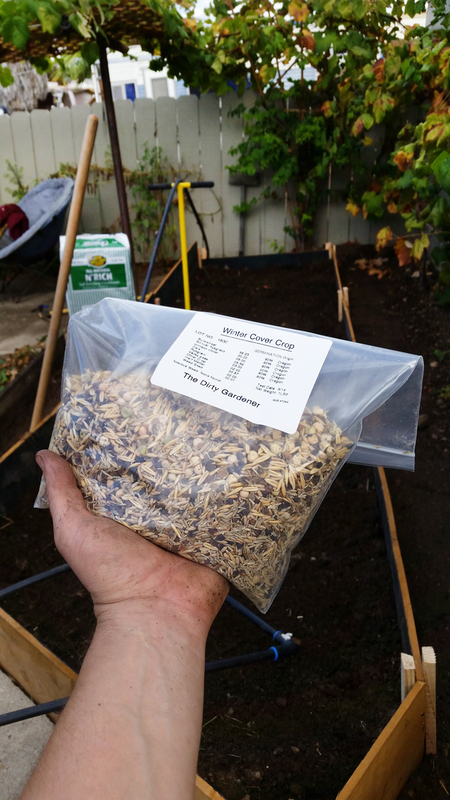 I went with the Sustain Seed Winter blend from The Dirty Gardener available on Amazon. Here’s the mix of my winter work force. I may add radishes as well because I’ve read that their roots penetrate deeply into the ground. I’ll see what the above ingredients do first though. I simply broadcast the seeds by hand after mixing up the bag to get a nice even species mix. 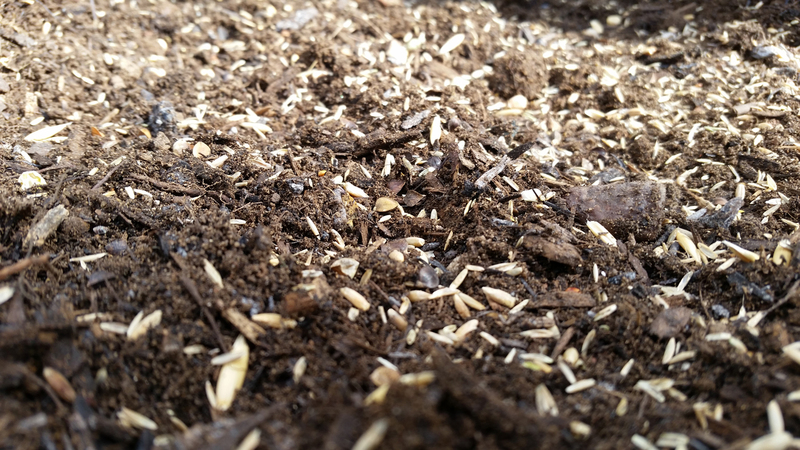 I then lightly raked the seeds into the first inch of soil so the birds don’t eat up all my crops! Once that was done, I waited to see if anything would sprout up right away like Jack and the beanstalk. Spoiler alert, it didn’t. So it goes. 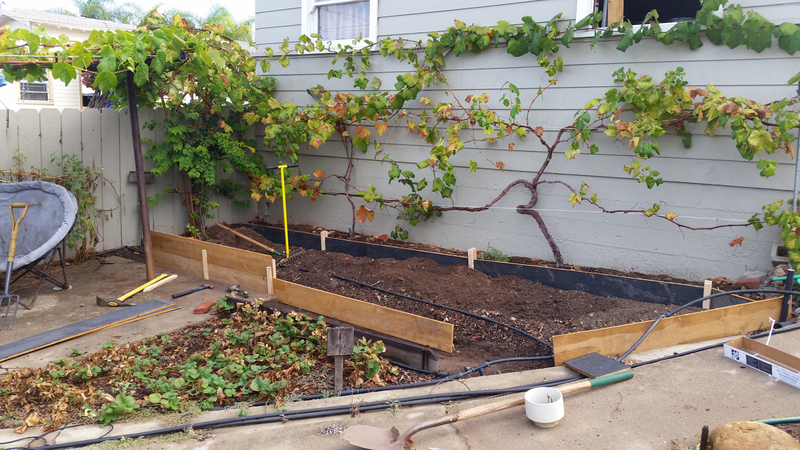 The next step was to adjust the micro irrigation set up so to better fit in my new garden space. Much better! I use 1/2 gallon drippers every 16″ inches as well as a few adjustable sprayers that move around as needed. This bed is officially ready to grow! But I’m not done yet. I also wanted to do something to the pathways around the bed to help save some future weed headaches. This is also a new method for me that I’ve been reading about on other blogs. Using wet cardboard and straw as a weed barrier on the footpaths. I hope it works, because I’m growing weary of all the weeding I have to do in this garden. First thing I did was to soak the cardboard in water. 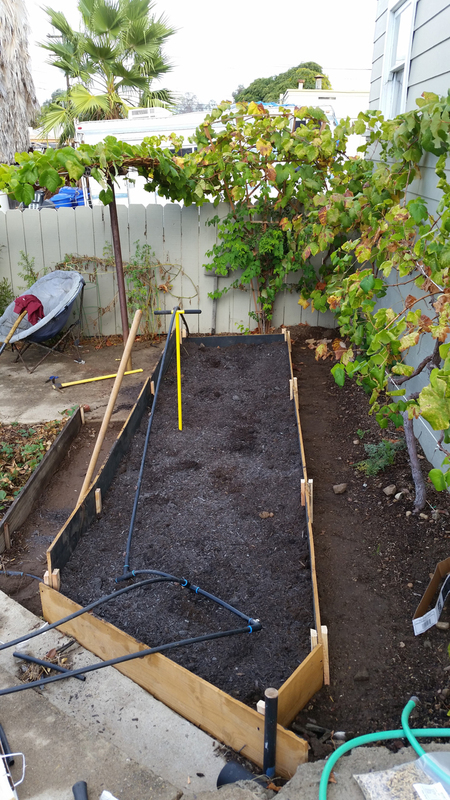 This helps make it permeable and easily conforms to the surface of the dirt. If it were dry, all the water would move off of it like a shingle. I want to incorporate it into the system and allow it to break down over time. I began layering the cardboard around making sure it overlapped everywhere. If any sunlight gets through, then so do the weeds! 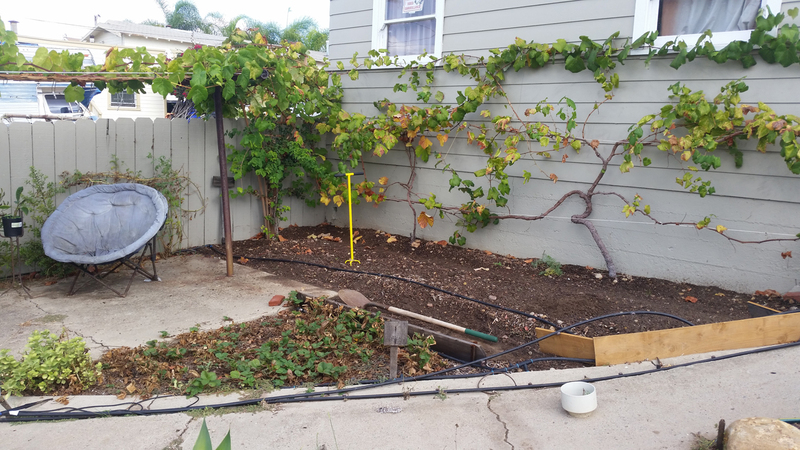 I left spaces around my existing grape vines as well as a single carrot that survived the pig apocalypse last month. Ha Hamilton! You missed one! 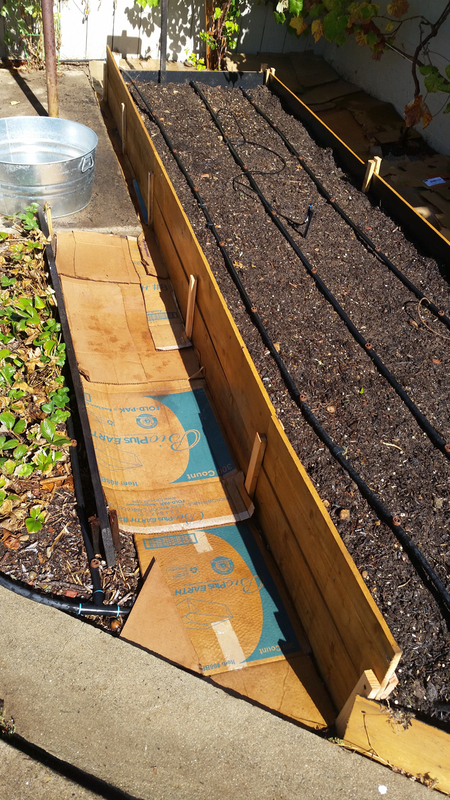 It’s important to not cover these areas with cardboard so you can add fertilizer when needed. 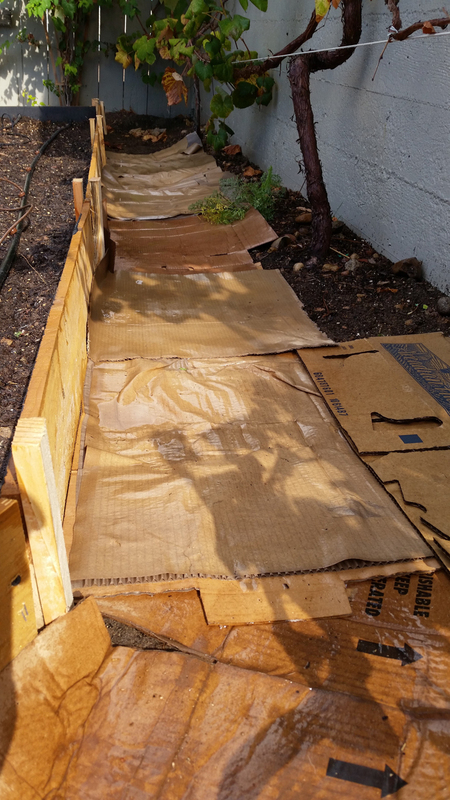 Eventually the cardboard will break down and the grape vine roots are all over the place now anyways. Another reason why I wanted to have a raised bed! 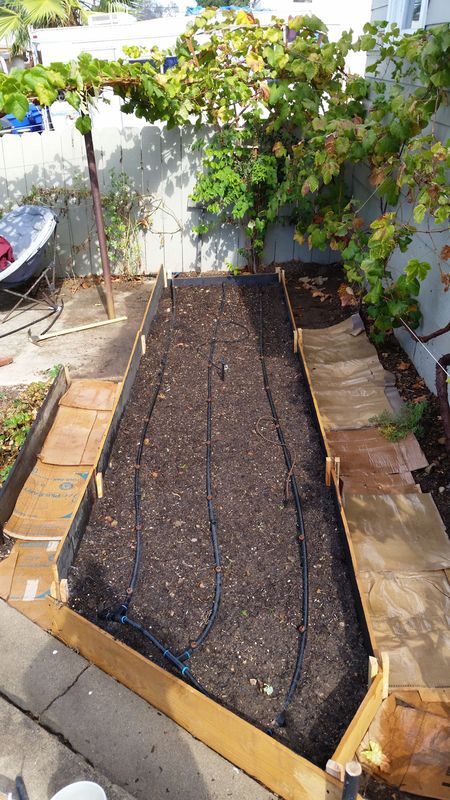 After I finished with the cardboard, I added a layer of straw to help retain moisture as well as give my knees a comfy bed when I work in the garden. It also gives the whole space a cleaner look. Notice the rain barrel on the right hand side. And voilà, there you have it! I’ll post some photos when things begin to grow due to the fact that I will be watching it daily. A nice watering and it’s germination time. I’m really excited to see the results of this winter cover crop and I hope it bears much fruit next growing season. 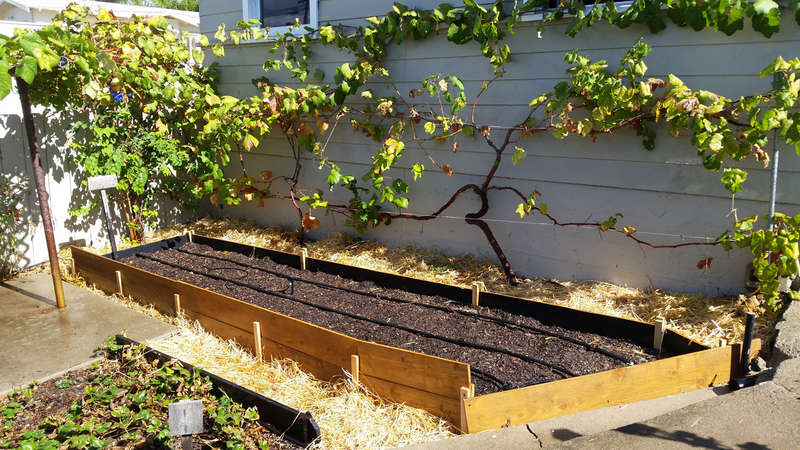 If you live somewhere where winter is upon you, you can start this project in the early fall as soon as your summer harvest is completed. Let it grow as long as you can, or let the frost kill it off. Then chop it down and leave everything on top of the soil or till it in. the winter snow will take care of the rest and come next spring you will have nutrient rich repaired soil ready for your veggies! In my Mediterranean climate, I’ll just let it go to seed or harvest whatever fruit it bears. If I do let it go to seed, I will save the seeds for next fall and cut out the middle man. Well folks, that was this weekends project. I could’ve done more but the Halloween festivities have somehow made me weaker and in search of much aspirin, water and couch naps. Getting old really takes a toll on you. Until next time, keep those hands dirty! Useful for those in the Northern Hemisphere! Well I certainly learned alot! Years ago it seemed our soil lost any nutrients to sustain a veggie bed and we finally gave up on it. 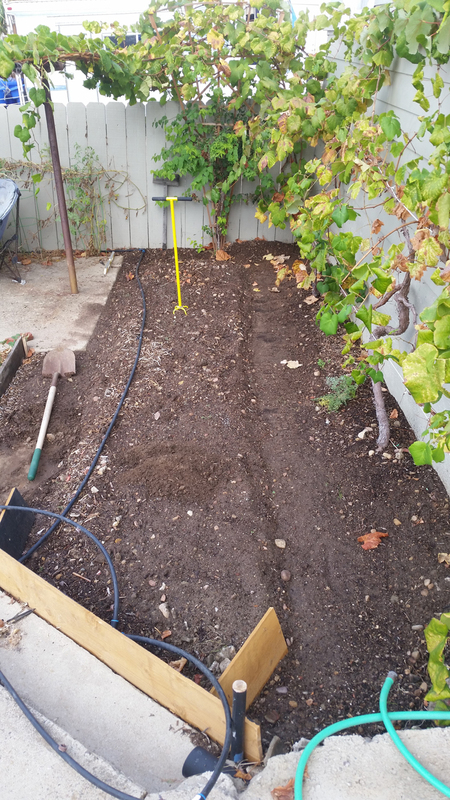 Had we only known to do this……..
It’s never too late to put those nutrients back in the ground! Planting a cover crop like this is the easiest way to do it as well. Perhaps next season you can give it a go! Great post! Cover crops are so beneficial. If I would have moved into my new place in time I would have started the garden this way. Since it’s October in the Northeast we opted for a lasagna-style setup with leaf mulch, cardboard, grass clippings and manure. Love this blog! Ahh yes, the no till method is also a great option! Until my desert back yard grows bigger, I am short on supplies. In the meantime, I’ve been pilfering other people’s bags of leaves. They must think I’m crazy stealing “trash” from their curbs. But I think it’s they that are nuts for throwing away leafy gold. You made your bed; now go lie in it. Ouch! That pun hurt me. Wonderful post! Soil repairing is so important! Thanks for sharing! I learned really a lot! Thank you Francesca, I’m glad you liked it! Learning about the soil quality has really helped me to get way better results. I’m still learning too. Have a great day! Just saw this, over a year and a half later. I am curious about your results, especially with regard to letting the plants go to seed. Most advice I have seen on cover cropping indicates one should cut back or till under the plants before seed development, else the cover crop becomes spring weeds. Collecting seeds is a great idea but I find getting all of them to be a bit of a hassle. What did you find with your method? Hi Maggie! The amount of regrowth from letting them go to seed was minimal. The ones that did come back again I would just pull and place on top of the mulch. So, it was actually useful although minimal. That being said, based on not getting much of harvest off of the winter crop, I may trim it earlier next time. I found that the rye was the one that made a second or third visit to the garden. But, again, not in any weed-like sense. We put a cover crop in one bed this winter (oats, clover, peas) because we were not going to plant it otherwise. We were planning to make the area into a chicken run this year and e did not want to leave it bare and allow a bunch of weeds to take it over. Every time the plants got tall, I did the “chop and drop” including any flower heads, right back on the bed. It did well during the rains. We have not gotten the chickens going this year, and have not watered the area either this summer at all. We shall see what happens when the rains come. i hope some of them reseed. I dont think we get to the chickens till next spring, at the earliest. I’m sure you’ll get a resurgence of some of those. I was actively pulling new sprouts to stop them from coming back. If you do nothing, then they’re bound to return. Whatever grows there, the chickens will make short work of it indeed! 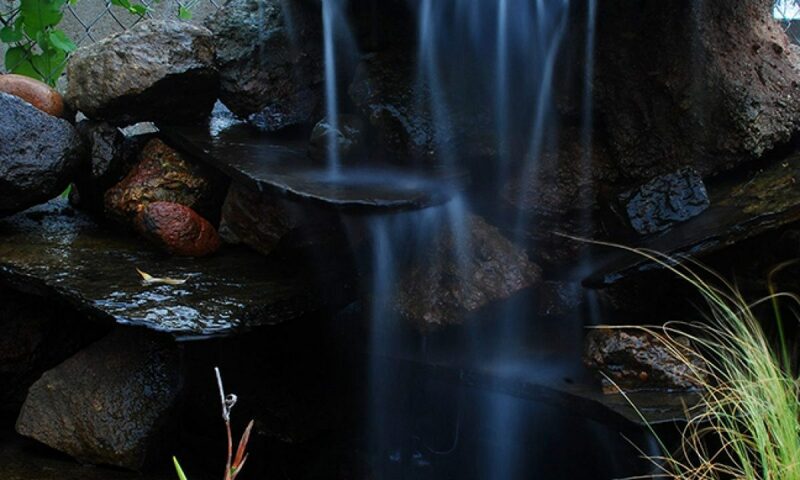 Next PostNext DIY Greywater System: Save money, save the world!